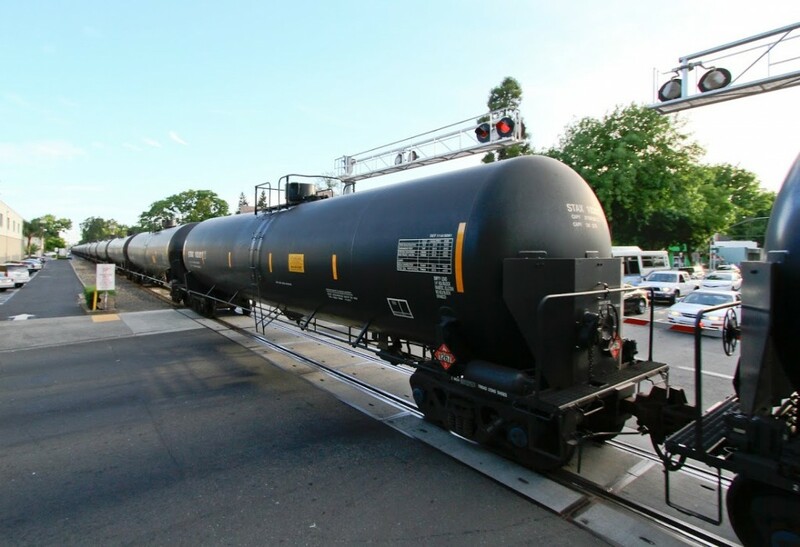 The environmental group Earthjustice is suing the U.S. Department of Transportation over the safety of the rail cars used to carry crude oil to California and around the country. Old tank cars, known as DOT-111s, have been involved in a number of fiery accidents. In July, Earthjustice asked the DOT to issue an emergency order that would prohibit the use of unsafe tanks cars to carry volatile crude oil from North Dakota's Bakken formation. Now the group is suing, saying transportation officials never responded to that petition. The DOT has proposed regulations that would eventually replace the unsafe cars. But it could take years for those rules to phase in, said Patti Goldman, an attorney at Earthjustice. "They would still allow these railcars to be shipping crude oil and hazardous materials for about four more years," she said. "And that's just too long to expose the public to these types of risks." Earthjustice filed the lawsuit with the 9th U.S. Circuit Court of Appeals on behalf of the Sierra Club and ForestEthics. Last July, a train carrying Bakken crude exploded in Quebec, killing 47 people in the town of Lac-Mégantic. In response, Canada is starting to phase out the oldest tank cars. But that concerns Goldman, too. "The worst tank cars are likely to shift from the Canadian fleet to the U.S. fleet," she said, "unless the secretary of transportation acts [to ban them]." In an investigation earlier this year, KPIX discovered that crude oil was being transported to a rail yard in Richmond. The tank cars, according to KPIX, were DOT-111s. There are two other proposed crude-by-rail terminals in the Bay Area. One in Pittsburg is currently on hold, and one in Benicia, at the Valero refinery. The public comment period on the Valero project closes September 15. Earlier this week, the Kern County Board of Supervisors unanimously approved what will be California's largest crude-by-rail facility. Officials involved with that project say they will use newer, safer cars, not DOT-111s. A spokesman for the DOT's Pipeline and Hazardous Materials Safety Administration said the agency does not comment on pending or active litigation.